Passed BE/B.Tech Degree or 3 Year Full Time Engineering Diploma in Electrical/Mechanical/Civil Engineering Discipline from any Recognized University/Institute. Eligible Candidates can Submit Online Application at the Official Website of SSC Latest by 25th February 2019. Applicants First Open SSC or SSC Online Official Website. 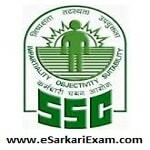 Click on SSC Junior Engineer Exam 2019 Advertisement Link.